Nowadays, traditional computer stands just don’t cut it for many work stations. With the rising popularity of multi-screen setups, plenty of people are integrating monitor mounts to their computer desk setup. Here, we’ll tell you how to find the best monitor mount for your workspace and our top five favorite options available on the market. Sitting improperly can lead to discomfort in the shoulders, back, and hips, and may even cause long-term damage to your posture. Using a monitor mount can help to keep you sitting in the right position and keep stress off your pressure points. You can adjust your monitor to the proper ergonomic height to suit your body by using the right monitor mount. 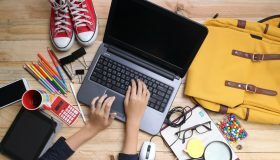 By keeping your computer at eye level, you avoid bending or looking down, which helps to keep your spine and shoulders in proper alignment. Another major benefit is that computer monitor mounts free up more work area on your desk. 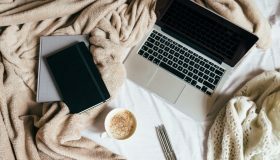 You can lift your computer screen or push it out of the way entirely, leaving you with more room to spread out and work. 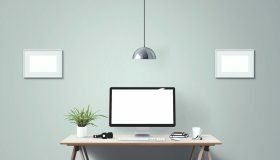 When shopping for a monitor mount for your desk, you’ll want to consider the available features to determine the best monitor mount for your needs. 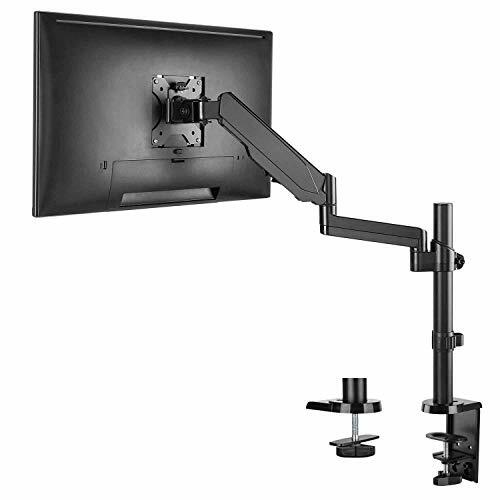 Most mount designs are adjustable, allowing you to move your screen, tilt and rotate it, or retract it for more desk space. It’s a good idea to look for an adjustable monitor mount so that you can customize your workspace to your unique body and posture. 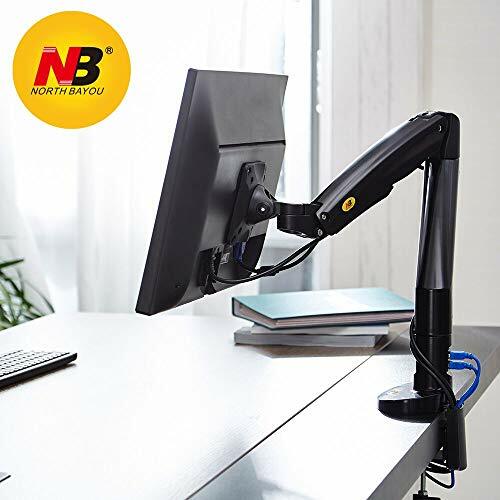 You can place it at an angle that alleviates strain on your eyes, shoulders, neck, and back as you work. An adjustable mount is also a good idea for computers with multiple users. 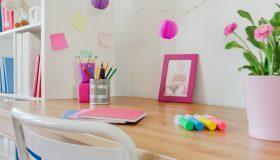 If you share your workspace with a significant other, roommates, or children, the right monitor mount ensures that everyone can find a comfortable position in which to work. 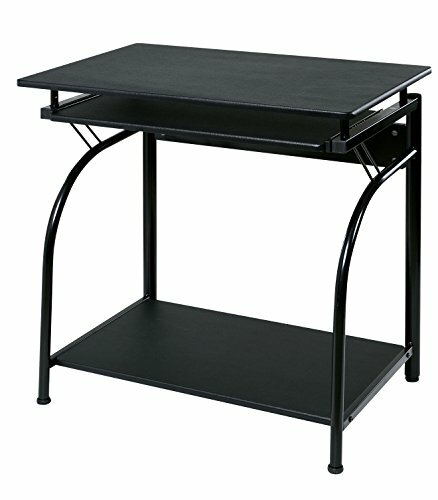 A mount has to support the size, weight, and shape of your entire monitor setup without damaging your computer, your desk, or the wall. 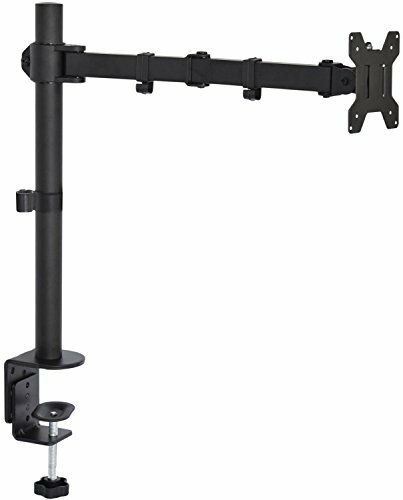 Using a heavy-duty arm with a light monitor, for example, may not offer the tension a mount needs to stay in place. Conversely, too heavy of a monitor might break a lightweight arm or damage the wall behind it. You should look for a mount with a weight capacity that can handle your monitor. If you have heavy equipment, it may be best to look for options built of stronger materials such as steel or carbon fiber rather than aluminum or plastic. Using a mount with your monitor doesn’t do much to clean up the aesthetics of your office if there’s no cable management system in place. If you’re concerned about space or appearances, it’s best to look for a monitor mount with a built-in hook, hole, or catch to keep wires out of the way. A cable management setup can also help to reduce your risk of injury in the event of spills or electrical shortages. Monitor mounts should be compliant with standards set forth by the Video Electronics Standards Association, more commonly known as VESA. A VESA value refers to the drilled hole pattern on your mount, which needs to match that on the back of your computer casing. VESA certifications are measured in millimeters. For smaller monitors, the most common VESA value can range anywhere from 100 X 100 mm to 75 X 75 mm. Mid-size setups often have a hole pattern around VESA 200 X 100, and larger displays usually have hole patterns spaced in increments of 200 mm. Not only does you monitor mount have to be compatible with your screen but also your desktop. Most attach to the surface with a clamp or a more secure grommet hole adapter. Regardless of how the mount goes on, you should make sure that it is able to fit your desk model. Clamp or grommet, your mount should fit comfortably around the width of your desk without sliding or compressing any of the materials. Here are our top five picks for the best monitor mounts available. This heavy-duty arm is built to withstand wear and tear, boasting a robust 3.5-inch metal C-clamp, a 3.3-inch grommet base, and a thick steel arm. The WALI desk mount can support screens up to 32 inches in size and weighing up to 17.6 lbs, making it appropriate for most mid-size monitors. This mount is VESA compatible with 75 X 75 mm or 100 X 100 mm configurations, two of the most common on the market. It can fit a wide variety of computer and TV screen models. A two-stage locking system keeps the assembly in place, ensuring that your computer stays at the appropriate height. Some users have found that the bolts loosen quickly, however, and so you need to tighten them every so often. The monitor mount uses a gas spring mechanism to adjust your screen and hold it in place. The stand can tilt by 35 degrees, swivel by 90 degrees, and rotate a full 360 degrees. Supports most mid-size monitors up to 17.6 lbs. Doesn't support monitors over 17.6 lbs. 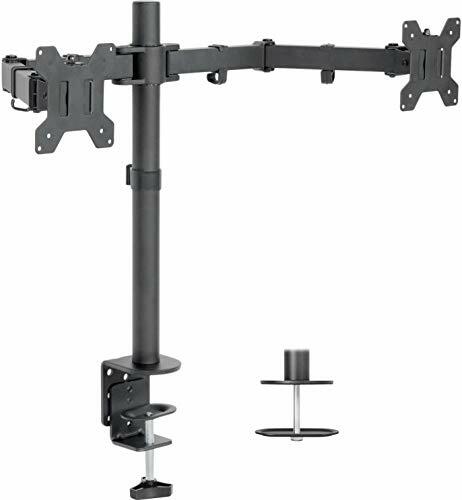 This monitor mount boasts a simple design, making it easy to set up. The setup includes detailed instructions and the tools that you’ll need to assemble the arm. 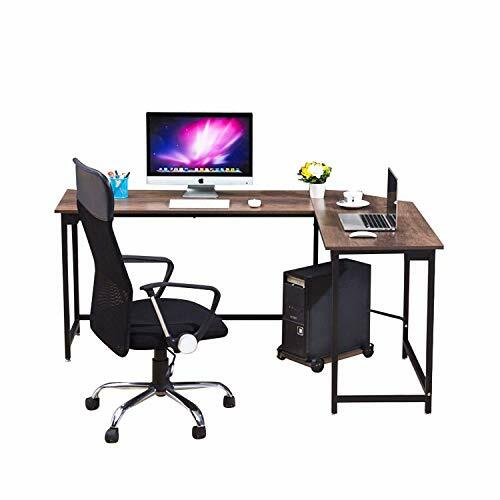 The AmazonBasics Single Monitor Stand adjusts smoothly, helping to keep strain off of your back and preventing damage to your delicate screen. The arm has a wide range of movement, with the ability to extend and retract, switch between landscape and portrait mode, and tilt between 70 degrees back and 5 degrees forward. This mount can fit a wide range of desks using a clamp that adjusts from 0.4-inch to 2.4-inch. It can also handle mid-sized monitors measuring 32-inch or smaller and has a weight capacity of up to 25 lbs. The AmazonBasics mount is VESA compatible. It can fit a 100 X 100 mm or 75 X 75 mm configuration. This versatile stand is good for small- to mid-size monitors. It’s compatible with most screens between 13-inch and 27-inch in size and can handle up to 22 lbs. 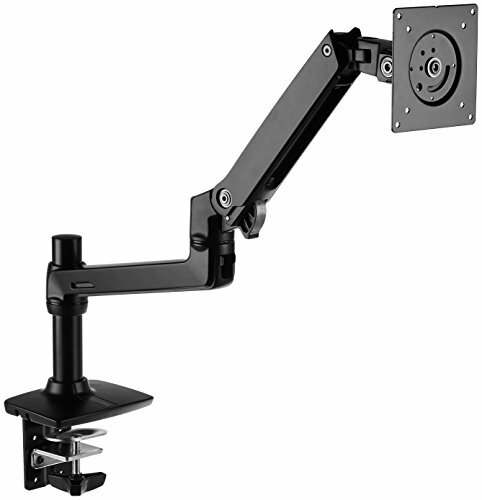 The VIVO Single Desk Mount Stand is VESA compatible with 75 X 75 mm or 100 X 100 mounting holes. It attaches to your desk using a heavy-duty C-clamp or a grommet mount, depending on which suits your setup better. The mount offers full articulation with an adjustable arm that can tilt 15 degrees and both swivel and rotate a full 360 degrees. A cable management system built into the arm allows you to keep your wires organized and out of the way using detachable cable clips. If you’re looking for a more advanced computer setup, this monitor mount allows you to fit two separate screens on your desk and gives you more space to work. The dual setup offered by the VIVO Dual Desk Mount Stand is also ideal for gamers who want a more immersive experience. Each arm can fit a monitor ranging from 13-inches to 27-inches in size and weighing up to 22 lbs. The assembly is VESA compatible with a 75 X 75 mm or 100 X 100 mm back configuration. The dual arm is fully adjustable, offering up to a 90 degrees tilt, 180 degrees swivel, 360 degree rotation, and height adjustment. To keep wires out of the way, the dual arm setup has an integrated cable management system with detachable clips. You can easily secure wires to each arm and the center pole. This mount is best for large, lightweight monitors. It’s able to fit most screens between 22-inches and 35-inches that weigh under 19.8 lbs. The arm includes a cable management system for a clutter-free desk. The monitor mount is VESA compliant, fitting 75x75mm or 100x100mm backside mounting holes. You can attach it to most desks using either a clamp or grommet installation. The arm can tilt up to 55 degrees tilt and offers both 360 degrees rotation and 360 degrees swivel. The entire assembly can lift your screen up to 13.5-inches in height. Two built-in USB ports allow you to easily charge your tablet, phone, or other devices without wasting computer hubs or taking up desk space. Out of all the monitor mounts we’ve looked at, our favorite is the WALI Premium Single LCD Monitor Desk Mount. We’re a big fan of its heavy-duty assembly and its wide range of adjustability. It’s also VESA compatible with the most common mounting hole configurations. 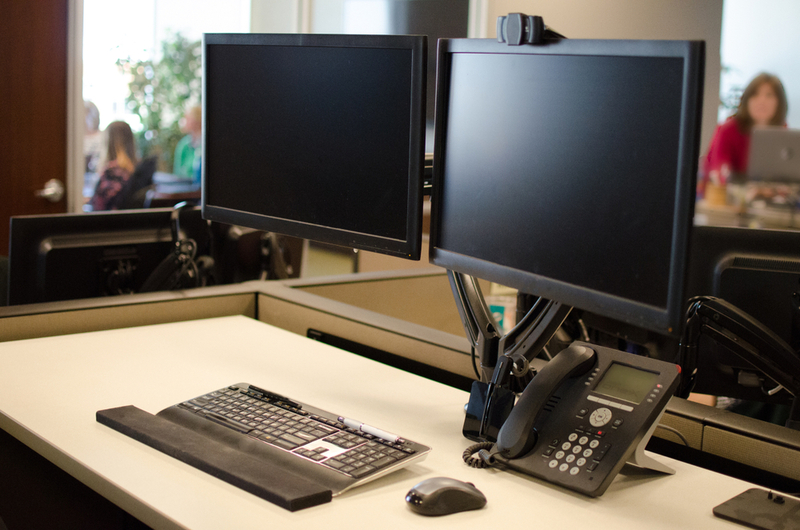 By redesigning your office space with the right monitor mount, you can stay comfortable and free up more desk space as you work on your most important projects. 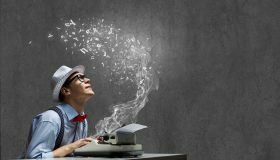 You may even see an increase in your productivity throughout the workday.